NBC Sports may have a team of 250 on hand at the Ryder Cup, but, in Orlando, hundreds more are working hard on the Live From studio show, pre/postmatch coverage, and press conferences. The workflow is leveraging fiber connectivity, the NEWBERT flypack, and a new transmission kit — three operational changes since the Ryder Cup was previously held in Europe, in 2014 at Gleneagles, Scotland. The other big change? 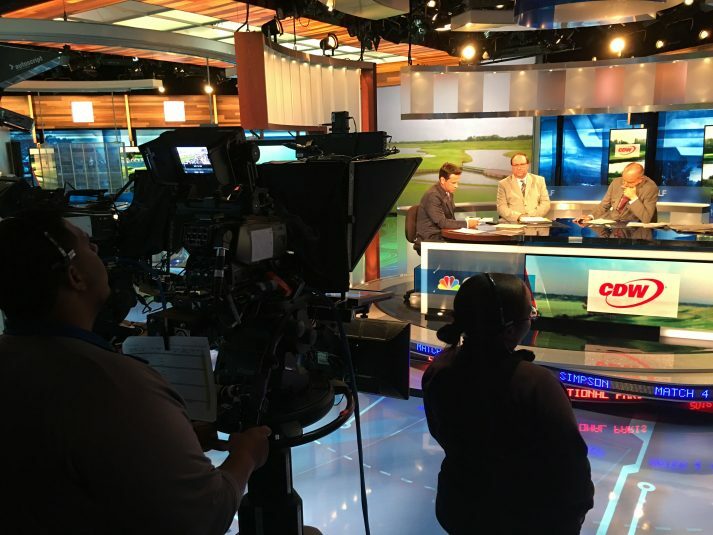 This is the first Ryder Cup for which NBC Sports has tapped CTV OB to provide its remote-production facilities. 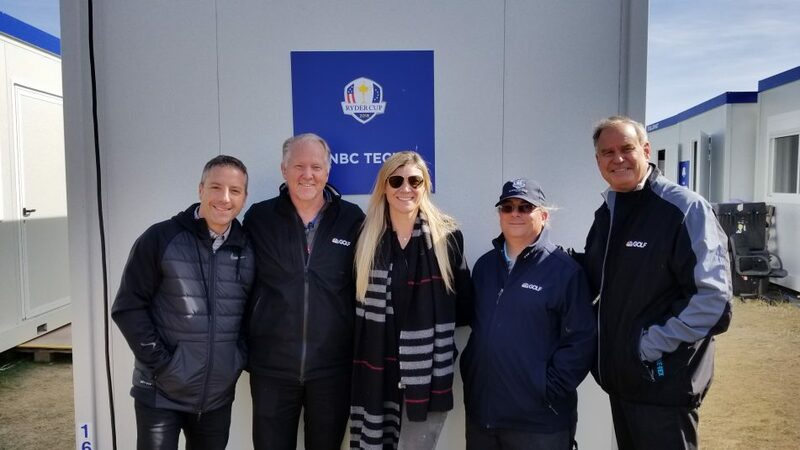 From left: Ryan Soucy, Keith Kice, Allison McAllister, Marc Caputo, and Ken Goss are working closely with a team in Orlando on Ryder Cup coverage. According to Keith Kice, technical manager, NBC Sports, the Ryder Cup production team has feeds from 80 cameras at its disposal: 41 unilateral cameras and 39 from European Tour Productions’ world feed. It also has access to 128 channels of replay with nine EVS servers under the control of NBC operators and seven others handled by ETP staffers. Key to the efforts of those operators, Soucy says, is the work done by the five RF-camera operators on the course: one is assigned to each of the four groups on the course; the fifth is roving. As at The Open in July, the NEWBERT flypack is playing an important part in linking the TV compound at the course with Golf Channel’s production facility in Orlando. NEWBERT provides the Orlando team with integrated tally and router control, and the team has 14 traffic paths dedicated to Live From. There is also a primary and backup of the match coverage and then nine fiber paths return for closed circuit needs and also to ensure that the two reporters on site at the Ryder Cup are as in sync as possible with the team in Orlando. The Golf Channel studio team was tied into the Ryder Cup compound via fiber. Eric Gardner, VP, operations and technology, Golf Channel, who is in Orlando overseeing the operations, says that the use of fiber makes latency almost nonexistent and fewer than two frames make the roundtrip. Each event allows the team to figure out new ways to connect and also to get familiar with new levels of signal access. The tally connection is an important one in terms of communication, and, according to Gardner, the RTS RVON intercom over IP has been very solid. An investment in RVON cards has paid off with better clarity. Gardner says Golf Channel will be looking to do more roadshows and more “Live From” shows using NEWBERT and the transmission kit. Redundancy is a big part of the equation as well with redundant IPX routing cards, dual and diverse circuits, and dual streams for every path. He adds that Golf Channel will be looking to do more roadshows and more Live From shows using NEWBERT and the transmission kit. Redundancy is a big part of the equation as well, with two IPX routing cards, dual and diverse circuits, and dual streams for every path. Another improvement to NEWBERT since The Open in July is that it now has Sony HDC-1700 cameras.